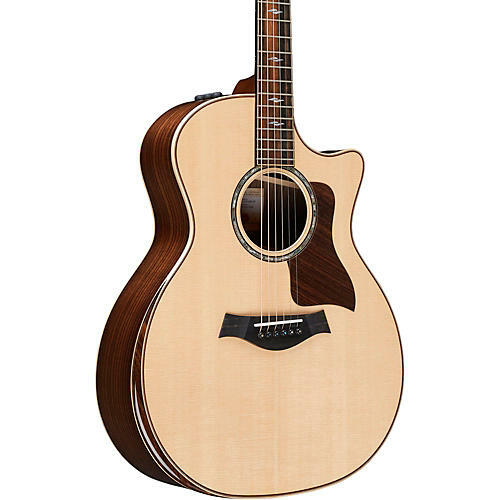 The essence of the Taylor playing experience lives within the rosewood/spruce 800 Series, which includes this 814ce DLX V-Class Grand Auditorium acoustic-electric. With the debut of its comprehensive redesign in 2014, master guitar designer Andy Powers took what was already Taylor’s flagship guitar and deployed an array of voicing enhancements, ranging from customized bracing and wood thicknesses for each body style to the use of an ultra-thin finish, to bring out another level of musicality. Taking these enhancements one step farther in 2018 with Taylor's innovative V-Class bracing, together, these refinements deliver much more than the sum of their parts. For everyone from pros to hobbyists, they make the playing experience more expressive, inspiring and fun. The volume, the sustain, the "in-tune-ness" of the instrument and its high-fidelity sonic detail combine to deliver a new level of player experience. The 814ce DLX V-Class guitar also features a specially designed radius-style armrest in maple with rosewood top edge trim, Sitka spruce bracing, and chrome Gotoh tuners. The radius armrest actually takes the edge off the playing experience, easing the physical stress on your strumming or picking arm. Sitka spruce bracing supercharges the tonal response to create a more dynamic voice. Gotoh 510 tuners supply a higher 21:1 gear ratio to give you finely calibrated tuning control. The 814ce DLX V-Class guitar comes with Taylor Expression System 2 electronics and ships in a Taylor deluxe hardshell case for optimal fit and protection. A guitar's top is the primary filter and distributor of vibrating string energy through the guitar, which means it has a huge impact on its sound. Sitka Spruce is the most prevalent guitar top wood of the modern era. It blends stiffness and elasticity in just the right proportions, which translates into broad dynamic range with crisp articulation. Solid Indian rosewood back and sides complement the Sitka top with sound that's made it one of the most popular tone woods ever. Rosewood produces the strongest bass response among the tonewoods commonly used for guitars, with a slightly scooped midrange. Rosewood's sweeping frequency range - deep lows that assert a throaty growl with sparkling highs - rings out with bell-like, high-fidelity clarity. It yields a full-range acoustic voice with complex overtones and extended sustain.